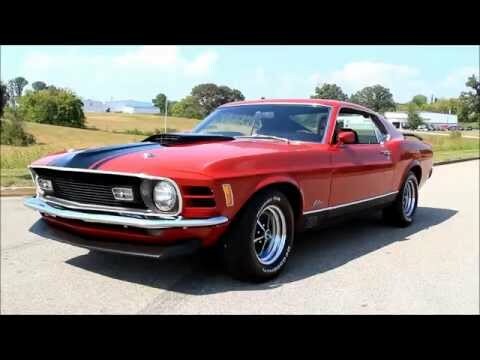 Up for sale we have a 1970 Ford Mustang Mach 1. This car has a lot of documentation like the Marti Report, Warranty Card, and multiple build sheets. The body is solid with good fit of the panels. This Mach 1 came with the twin color key racing mirrors. Also, it has the factory hood scoop that's done in black. The body is covered in the Medium Red that shows well and has a deep rich shine. It's accented by the front spoiler and rear wing that are done in black. The final touch is the 15” Magnum 500's with White Letter tires that look like new. On the inside the interior is all done black that complements the exterior perfectly and was the factory color for this car. The seats were recovered in the correct black vinyl covers with the comfort wire inserts and the gray stripe. This 'Stang has the factory console and 3 Speed Shifter. When you look at the dash it looks correct right down to the AM 8 Track Player.